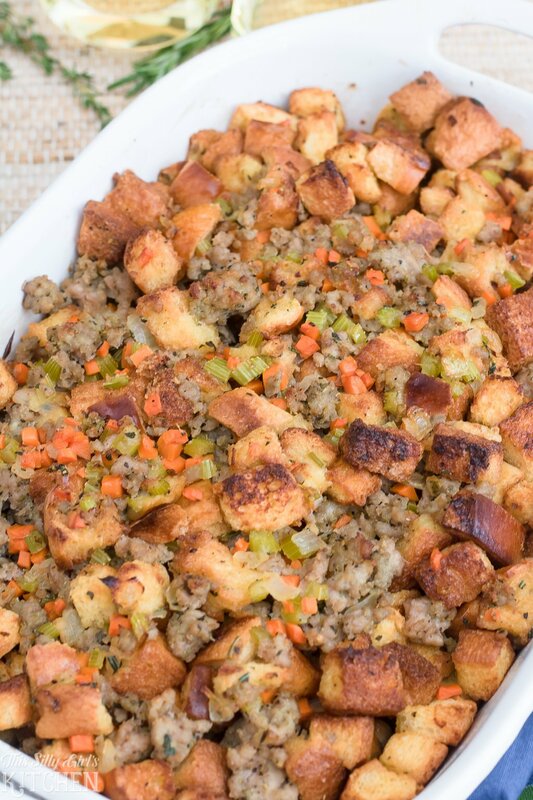 Italian Sausage Stuffing, made with homemade Italian sausage and brioche, a new family favorite! 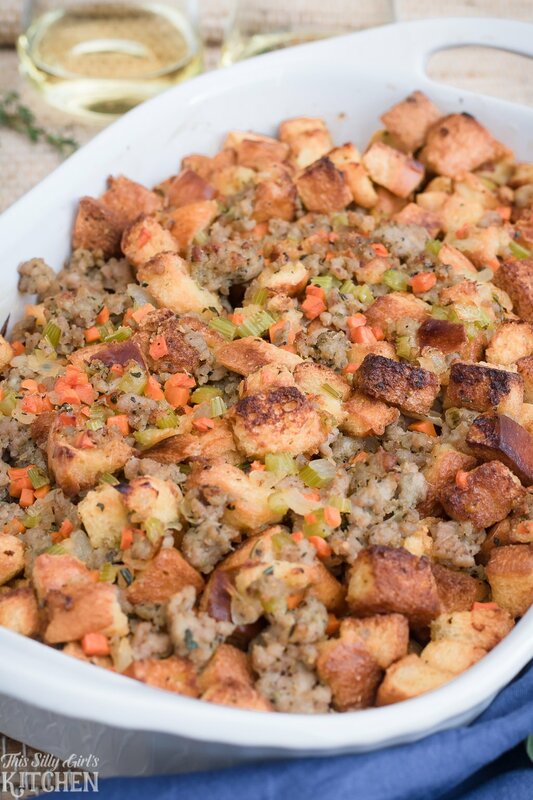 Italian Sausage Stuffing or dressing, if you want to get technical, is my new favorite side dish, and that’s saying a lot because I don’t like stuffing! Thank you, Cameron Hughes for sponsoring this post. 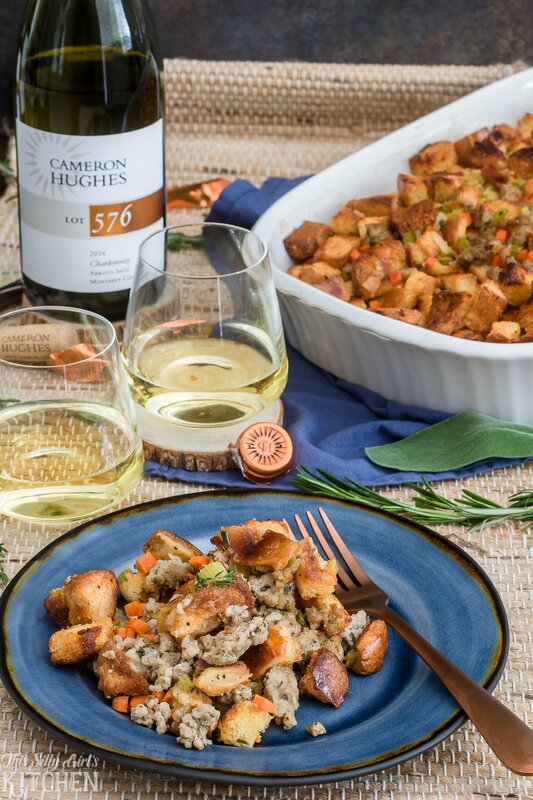 Capture the celebratory spirit of the holidays, and toast to the season with Cameron Hughes wine! I know, I know. I must be crazy right? Well, okay I’ve never really tried it. It just never appealed to me; bread soaked in stock and it’s all mushy and weird and just no. But, Jeremy LOVES stuffing and I want to make him happy so I came up with this homemade version of his favorite Thanksgiving side dish. And, now I’m in love with stuffing! I don’t know if it’s the homemade Italian sausage or the brioche bread or the veggies I used but… WOW! Okay, I do know what it is. It’s the brioche…. definitely the brioche. It is so good and hearty it’s practically a meal on its own. 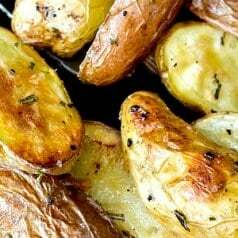 Served with a bottle of Cameron Hughes wine and you can’t go wrong! I happen to like a white wine with pork myself, so I cracked open this bottle of Cameron Hughes Chardonnay. 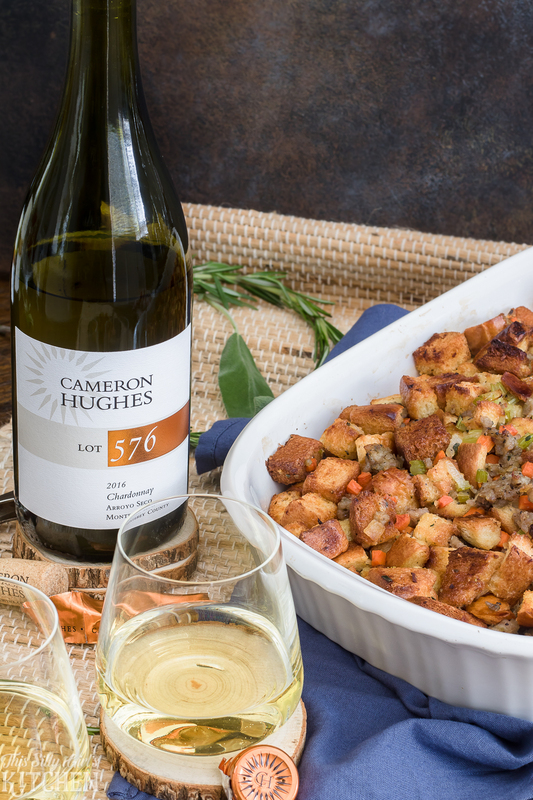 It pairs perfectly with this sausage dressing recipe! Cameron Hughes is an exceptional wine, with an extraordinary value. To me, these are a wonderful option for parties since they are so affordable. Great wine doesn’t have to be expensive! 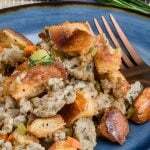 This Italian sausage stuffing is perfect for the holidays. But, it is so good you will want to make it any night of the week. I think it is great as a meal on its own with a small side salad. Making the homemade Italian sausage for this really sets it over the top! I love using my Italian sausage recipe in meals like this one but I also use it for pizzas, pasta, and soups! It is so versatile, definitely, keep this one on hand! Cut brioche into bite-sized cubes and toast in the oven. Make Italian sausage and brown on the stove. Sautee veggies in butter, deglaze with white wine and place everything in a large bowl and toss with stock. Bake until golden brown and delicious. Serve with Cameron Hughes wine. Feel free to use any stock you have on hand. Chicken, turkey, pork, or even vegetable stock works well! Can’t find brioche? No biggie, any loaf bread will do! Don’t have time to make your own sausage? No problem, just grab a pound of Italian sausage at the grocery store. They make it ground or in casings, just cut open the casings and fry up into crumbles. 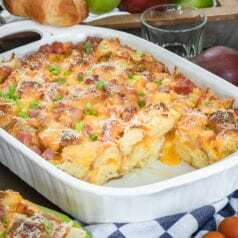 Sprinkle some mozzarella on top for an even more decadent stuffing! 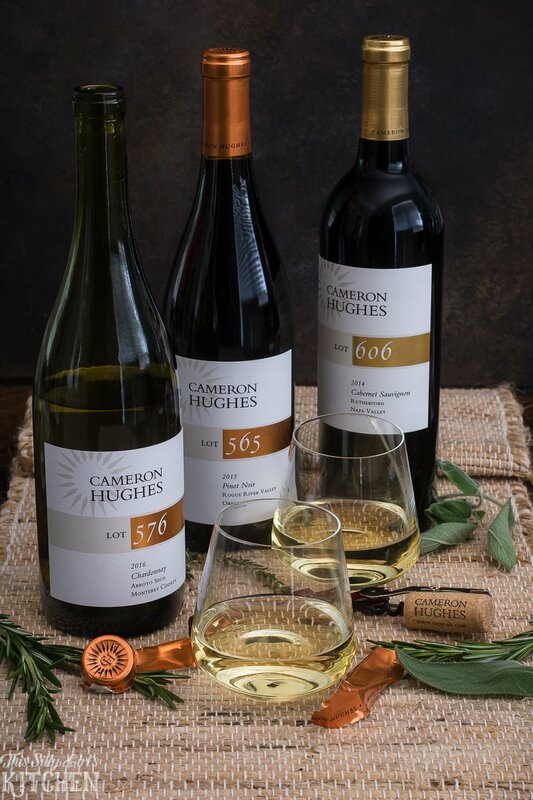 Click here to sign up for 15% off Cameron Hughes Wines! Make the sausage first by placing all the ingredients in a bowl and mixing until combined. Set aside. Preheat oven to 350 degrees. Divide the bread cubes between two sheet trays in an even layer. Toast for 10 minutes, flip and toast five more minutes until golden brown. Let cool, place in a large bowl. Brown sausage in a large pan over medium heat. Place into the bowl with the bread cubes. In the same pan, add the butter and melt over medium heat. Pour half of the butter into a small bowl and set aside. Using a brush, grease a 9x13 inch baking dish with the reserved butter, set aside. Place the onion, carrot, and celery in the pan with a pinch of kosher salt. Cook for 5-8 minutes until onions are translucent, stirring occasionally. Add the fresh herbs and cook for 2 additional minutes. Add the wine and deglaze the pan, scraping the bits off the bottom of the pan. Cook for about 1 minute until most of the liquid is absorbed. Pour into the large bowl with the sausage and bread. Toss to coat. Add the stock to the bowl and mix until everything is coated. Pour everything into the greased baking dish. Pour the remaining butter on top evenly. Bake for 30-45 minutes until browned on top. This recipe sounds so delicious! I love to use Italian recipes for the holidays. My mom’s side of the family is Italian and we always have my great grandmother’s spaghetti sauce Christmas eve and then we try something new for Christmas day. Love that the wine has Hughes in the name, too….my maiden name. 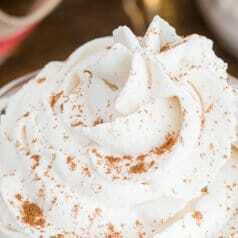 This recipe was made for me! 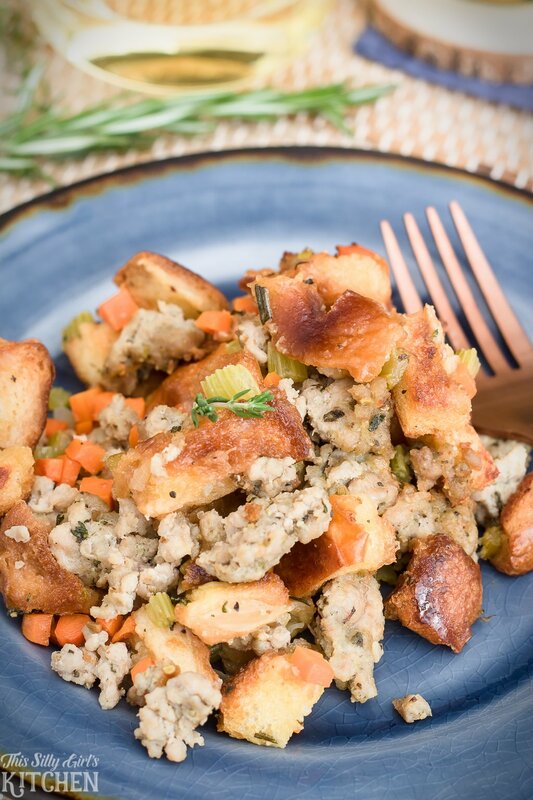 Stuffing is one of my favorite sides, can’t wait to give this recipe a try! Oooh- I’m saving this one! I’m still on the hunt for the perfect stuffing recipe. Your photography is breathtaking too- well done.